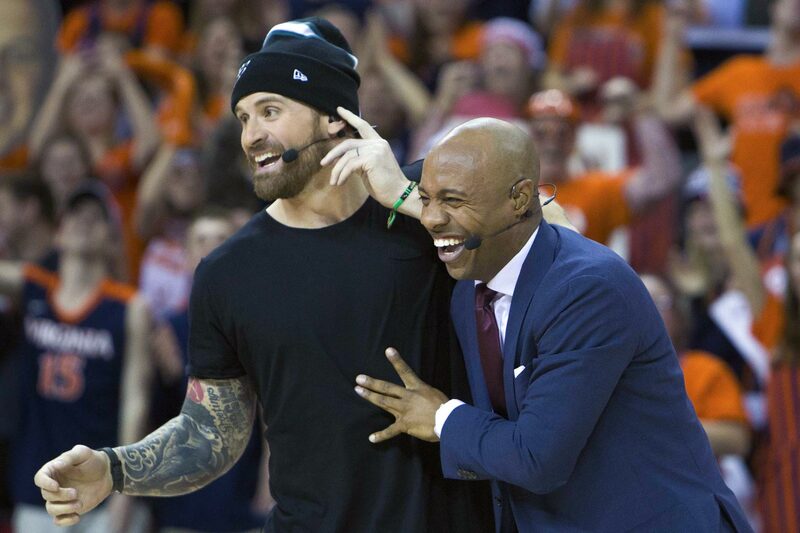 Alumnus Chris Long, who has used a standout professional football career as a platform to advance charitable causes, including wider access to education and safe water sources in Africa, will be the featured speaker at the University of Virginia’s Valedictory Exercises, to be held May 18 on the Lawn. Long, who studied sociology at UVA, said he was “extremely surprised and honored” to be invited to speak. “Then I was nervous,” he added. He said he has a few ideas about what he may want to talk about. “The hardest part about speaking in front of such an esteemed group is giving them a perspective they may not already have,” he said. Long’s history of involvement in the Charlottesville community made him the perfect choice to give the valedictory address, said Class of 2018 Trustee Erik Roberts, who chaired the graduation committee. Members of the graduating class are very service-oriented, he said, and several events in the community that grabbed national headlines during their time on Grounds only deepened that involvement. Long, who grew up in Charlottesville and attended St. Anne’s Belfield School, had an outstanding football career as a defensive end at UVA, where he was a team leader; his teammates selected him as a captain in both his third and fourth years. In his final Cavalier season, Long tallied 14 sacks, was a consensus All-American choice, was voted Atlantic Coast Conference Defensive Player of the Year and earned the Bill Dudley Award as the best college football player in Virginia. Long’s No. 91 jersey was retired before his final game in Scott Stadium. The St. Louis Rams selected Long with the No. 2 overall pick in the 2008 National Football League draft, and he quickly settled into his professional career, starting all 16 games of his rookie year. He played for eight seasons with the Rams before being released. Undaunted, Long signed a one-year contract with the New England Patriots in 2016 and helped them to a Super Bowl championship. Again finding himself as a free agent, he signed with the Philadelphia Eagles last season – and again helped his team to a championship, defeating his former Patriot teammates in the Super Bowl. While Long was a key contributor for the Eagles on the field, he earned even more attention off of it. Early in the 2017 season, the Chris Long Foundation, working with the Boys and Girls Club of Central Virginia, announced that Long would donate his first six game checks to fund two seven-year scholarships for underprivileged youth from the Charlottesville area at St. Anne’s Belfield School. Later in the season, he donated his 10 remaining game checks to organizations supporting educational equity and opportunity in the three cities where he had played professionally: St. Louis, Boston and Philadelphia. He launched the “Pledge 10 for Tomorrow” campaign, urging fans and businesses in those cities to make their own contributions to his educational partners – and pledging another $50,000 to the city that raised the most additional funds. This all comes in addition to the Chris Long Foundation’s efforts to raise money for “Waterboys,” an initiative dedicated to bringing clean water to villages in East Africa – and to bringing Long’s fellow professional athletes into the cause. Long started Waterboys in 2015 after a trek up Mount Kilimanjaro in Tanzania. Inspired by the region’s people and its beautiful natural scenery, Long realized that he could use his platform as an NFL player to bring clean water, and all of the benefits that come with it, to the villages he visited. The University previously announced that President Teresa A. Sullivan will give the keynote address at Final Exercises on May 19 and 20. Attendees at both Valedictory and Final exercises will be subject to a security screening before entering the event, and the University’s clear bag policy will be in effect.